The weather has finally changed enough that I think winter may actually be just around the corner. This long warm fall was a blessing, but as is typical with projects, I still failed to get my punch list finished. On the "before winter list" were a bunch of long overdue pile consolidations, with buggy wood trashed or burnt, a bunch put on it's respective surfaces where it belongs, and cutoffs given away as wildly desirable barnwood (strange, school wood doesn't carry the same cache). I also got around to winterizing the basement doors - and while I didn't get a chance to paint them, I did paint a bunch of other bits and pieces. 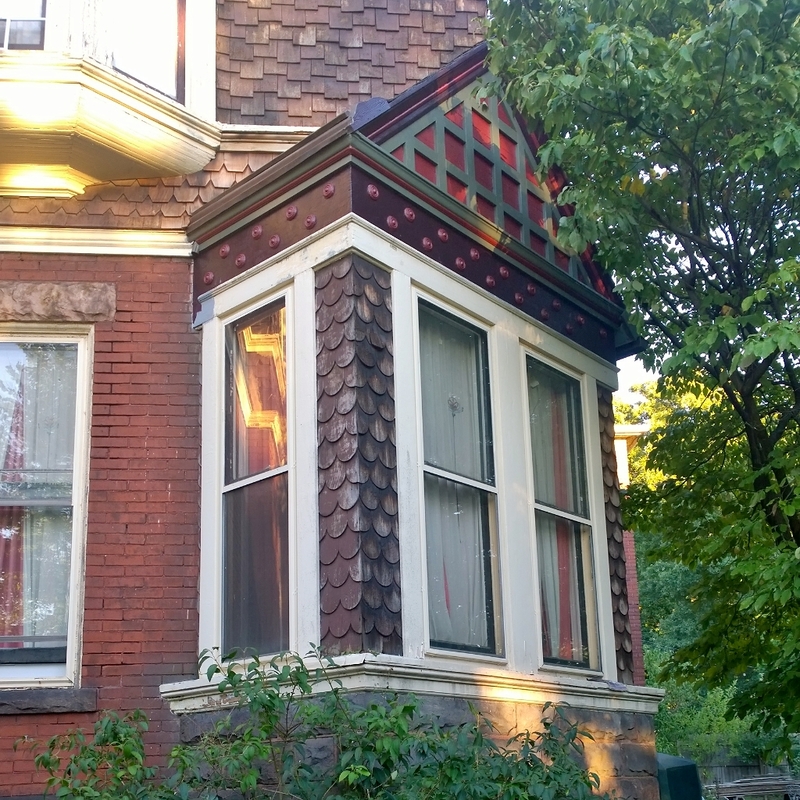 Included in those bits and pieces were the smallest gable, and the pair of dining room windows. 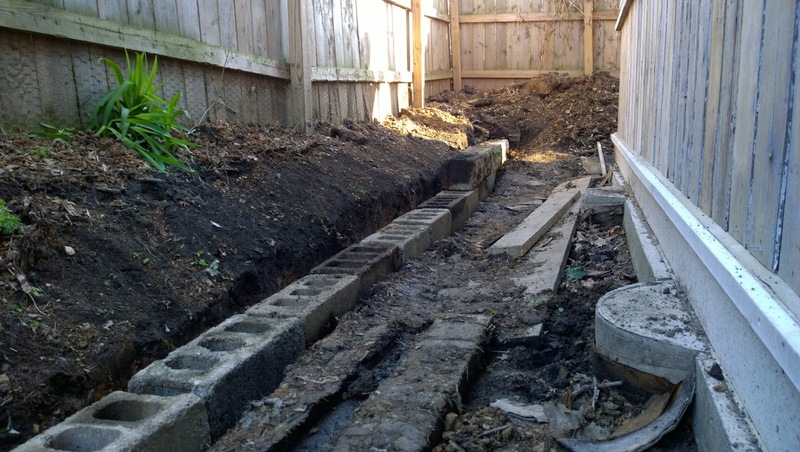 Also done is the onerous digging of the french drain. There seems to have been a stream that once came down the hill, which through the years now translates into a torrent of groundwater that was keeping the new brick floor of the schoolhouse perpetually damp. 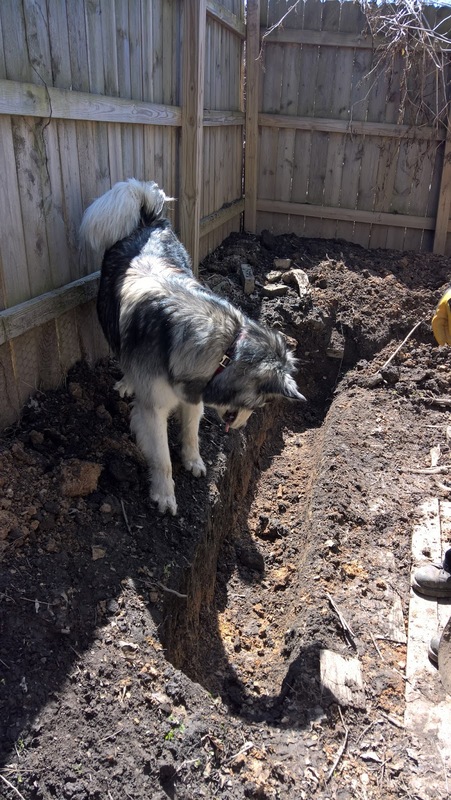 We dug down and put in a small retaining wall of cinder blocks we've dug up from around the property about three feet from the schoolhouse, and installed the french drain up against the sonotube foundation. There was nothing special about the install - landscape fabric, gravel, perforated pipe etc... but it wraps around the side and back of the building and seems to be doing a stellar job. We still need gutters, but at least we can push them back a couple of years. The wall used up the last of the block, for which I'm beyond grateful, and it doesn't look too terrible. At least, comparatively I suppose. The rest of the super huge blocks (which we think were the foundation to the most recent garage on the property) were stacked to finish off the retaining wall where Mount Trashmore once was. It'll have to be redone as some distant point, but for now seems like it'll be fine. There's been a bunch of other happenings, hopefully I'll be able to catch you all up in the next couple of weeks, before turning attention to porch planning and interior winter work. You could put dirt in the cinder blocks and plant something low maintenance in them like a low growing herb or the type of thing normally growing between bricks in a walkway. 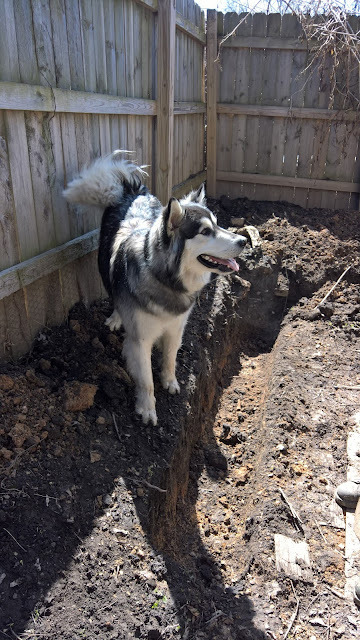 Yeah, he's great, dug the whole trench for us ;-) The area gets a surprising amount of sun, so I'm thinking of lining the upper level with berry bushes, we'll see what the spring brings. 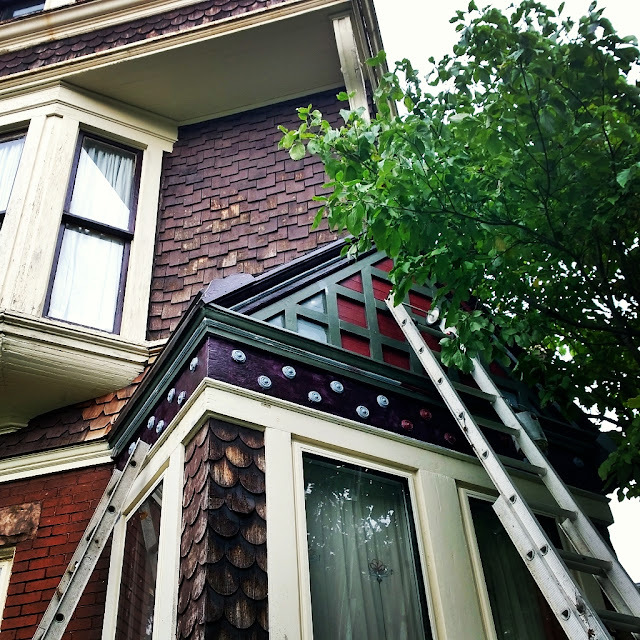 That gable looks so much better! How is the paneled detail constructed? Is it flat boards with the stiles and rails nailed on top, or is there more joinery to it? What keeps water out of the various layers? Thanks! It's so great to see the colors together on the house, even if it's just a small bit. The sheathing is diagonal tongue and groove boards, then there's a layer of horizontal tongue and groove on top. The stickwork is just 3/4x, with the upper flat edges flashed with tin. A lot of the tin has rotted away, so everything is now exceedingly well caulked since I would have had to dismantle everything to flash effectively. You tore off the vinyl on the lower gable AND tippy-top gable? WHAT were you thinking, silly girl???????? I did the big gable hanging out the window. In winter. Not my finest moment, especially since the vinyl was, if not protecting the very weathered wood, at least keeping the birds and squirrels out of the attic... But it was just. SO. DAMN. EXCITING!!! 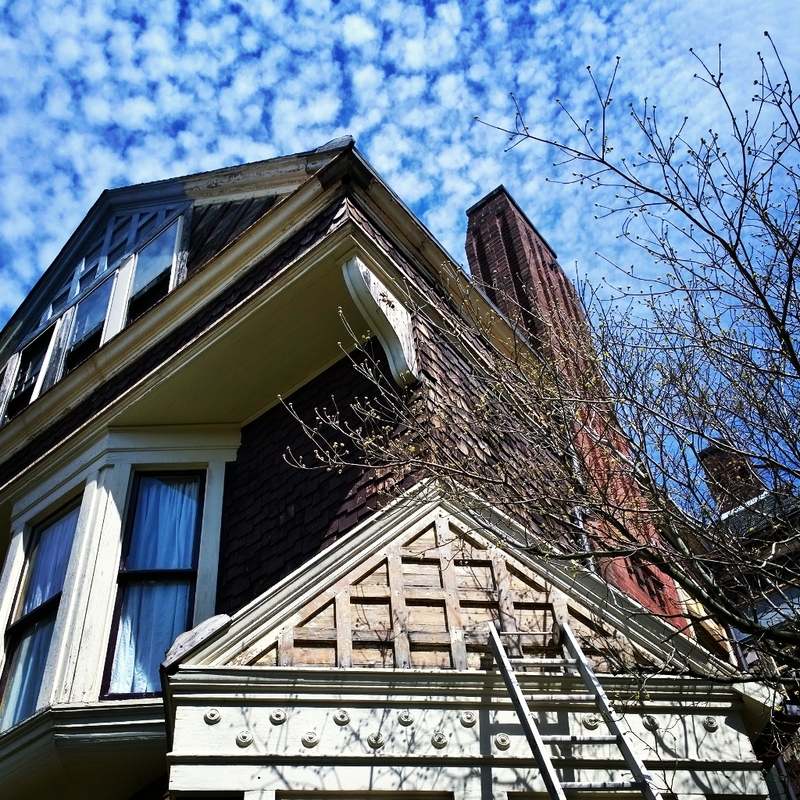 That gable looks great! And, congrats on the French Drain. Not fun, but great to have done. I would really rather do anything than dig a trench. And grading the slope was equally loathsome. But done now, so at least I don't have to worry about it over the winter!